Ever since Edward Snowden leaked top-secret National Security Agency (NSA) documents that revealed the extent of the US government’s surveillance program, the response from the art world has been vast and varied. In the past year alone a large statue of the whistleblower was erected in Manhattan and a controversial bust of Snowden — crafted by the same artists who recently revealed themselves as the masterminds behind We Are Always Listening — was featured in a surveillance-themed art fair. In another recent and ongoing project, New York-based artist Paolo Cirio is chastening key NSA, CIA, and FBI officials involved in the agencies’ surveillance programs by finding and disseminating across the world snapshots of them in informal or intimate contexts. Titled Overexposed, the series relies on open-source intelligence “to satirize both an era of ubiquitous mass surveillance and overly mediated political personas,” as the project site explains. 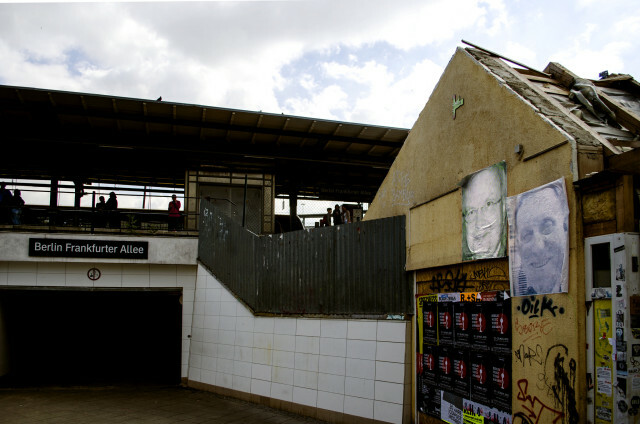 Using photographs of top officials he finds on social media as his source material, Cirio then creates large stencils of their faces, closely cropped, and either spray paints the portraits or plasters poster equivalents on public walls. 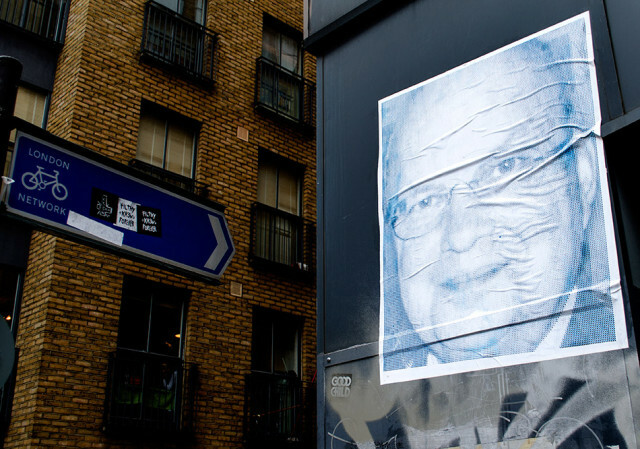 During the year he has worked on the project, he has pasted hundreds of these images throughout street art-saturated neighborhoods such as Shoreditch and Hackney in London, New York’s Lower East Side, East Berlin, and Belleville in Paris. Most of the images he has used so far have come from public Facebook and Twitter pages, with many posted by people who met the officials and shared photos of the encounters online. Overexposed currently targets nine officials: Keith Alexander (NSA), John Brennan (CIA), Michael Hayden (NSA), Michael Rogers (NSA), James Comey (FBI), James Clapper (NSA), David Petraeus (CIA), Caitlin Hayden (NSC), and Avril Haines (NSA). The series began when Cirio stumbled upon a comical photograph of former NSA director Keith Alexander taking a selfie with a woman who posted the picture on Facebook last year. 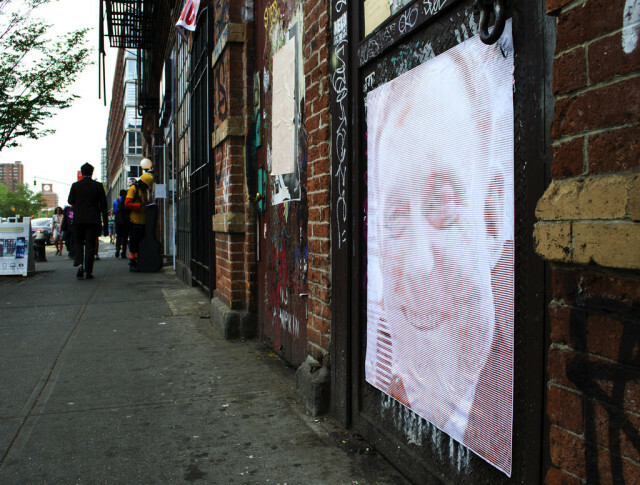 The find sparked his eagerness to discover and expose similar photos of US officials, whom Cirio describes as “war criminals who should be brought to justice.” He quickly realized that such images are easily attainable on social media; by comparison, when he tried to do the same with British intelligence officials, the task proved impossible because the government has apparently implemented a policy to remove any unauthorized images of them online, having realized that their existence poses a potential threat to national security. 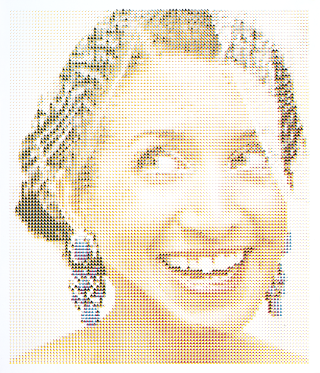 Cirio has a running collection of found photographs, but he selects ones that feature “funny expressions” to turn into stencils. “They are meant to embarrass the officials,” he emphasized. To further humiliate them, the series’ research catalogue also includes mocking captions of the original images followed by a history of each official’s wrongdoings. 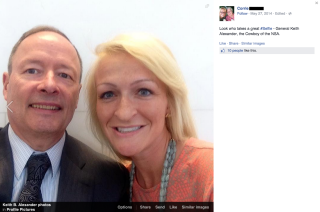 “Keith seems excited for this selfie taken by Corrie [redacted], a mysterious acquaintance of his whom he shares no apparent social connection with,” Cirio wrote under the Facebook photo. “He has his neck tucked into his collar and an awkward smile plastered across his face. 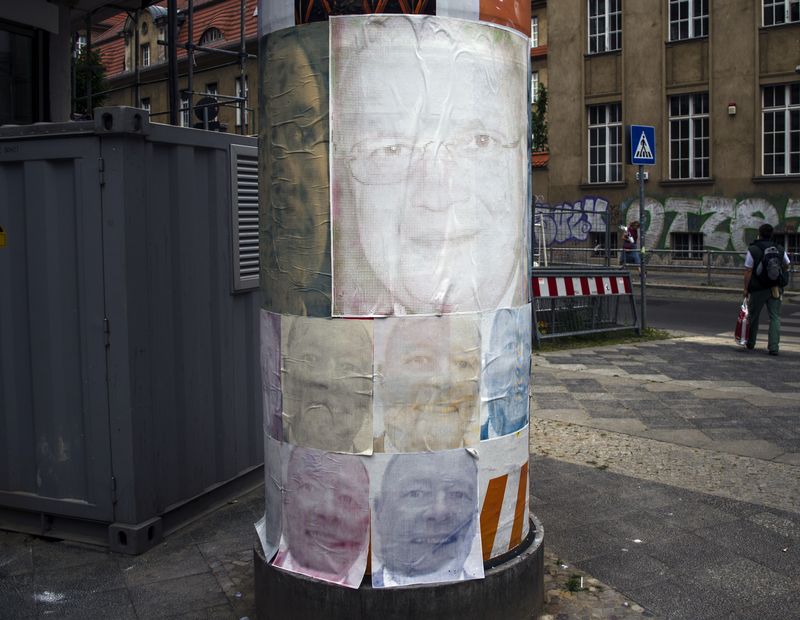 He and Corrie appear to be close and intimate, having fun with the selfie.” The corresponding stenciled portraits of Alexander, executed in multiple colors, have found homes on the sides of mailboxes in Manhattan and on billboards in Berlin. 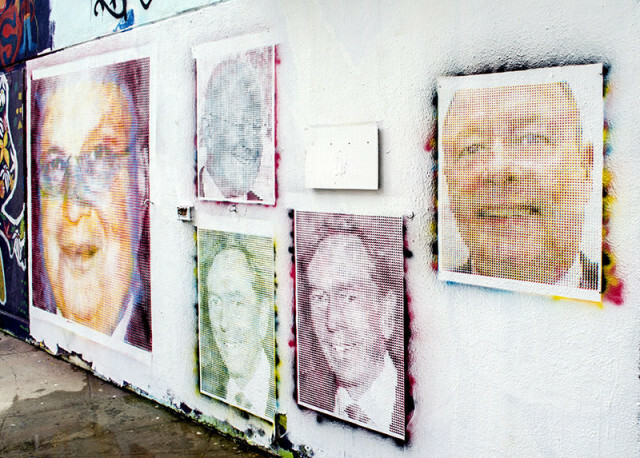 Brennan and Alexander are among the five out of Cirio’s total nine figures whom he chooses to expose through street art — the remaining four exist only as paintings — because he holds them most accountable for their involvement in illicit mass surveillance and hopes their presence in heavily trafficked areas will lead to increased sharing through public photography. 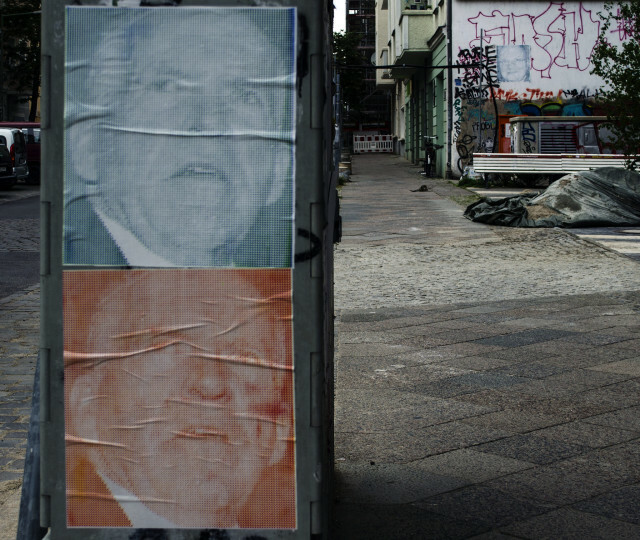 The stencil technique he uses is particularly apt because of the “legacy of graffiti for deriding and denouncing authorities,” he told Hyperallergic; meanwhile, he likens his paintings to mugshots, describing them as “portraits of cyber war criminals of the golden era of surveillance.” They are currently on view, through Monday, at NOME gallery in Berlin. For the next phase of Overexposed, Cirio plans to bring the works to Brooklyn, where renderings of his controversial subjects will exist as large-scale murals, covering entire building walls. His form of public shaming would be a welcome alternative to any advertising billboard.